Create a head-turning shine in 10 minutes or less! McKee's 37 10 Minute Paint Sealant is a state-of-the-art wipe on, walk away sealant that produces a dazzling shine and relentless water beading, month after month. Combine that with McKee's 37 Power Wash and Trademark Extender Spray Wax to take your vehicle's paint to the next level. This gloss-intensive kit contains all three products plus a handful of premium gold microfiber towels, a super soft chenille wash mitt, and a microfiber applicator pad. 10 Minute Paint Sealant by McKee's 37 is a clear-polymer that is applied unlike any traditional paste or liquid wax. Instead of applying with an applicator, waiting for it to haze over, and buffing off (what I describe as therapy), 10 Minute Paint Sealant falls into the category of wipe on, walk away sealants, meaning you simply spray it onto the surface, spread it out (side to side, then up and down) then – get this – walk away. No rubbing. No buffing. Oh, and you can apply 10 Minute Paint Sealant to all exterior surfaces including paint, glass, wheels, chrome, and smooth plastic trim. McKee’s 37 Trademark Extender Spray Wax is a polymer-infused, synthetic formula designed to enhance shine, extend paint protection, and provide a slick finish that resists dust and dirt build up. Use this gloss-intensive spray wax on all exterior surfaces – paint, wheels, glass, chrome, and plastic trim. This advanced formula uses a proprietary blend of super slippery polymers designed to create an extremely slick, glassy finish that complements all colors. Formulated in the hot, humid climate of south Florida, Trademark Extender Spray Wax is guaranteed not to streak, smear, or smudge – even in direct sunlight! Extends and enhances the look, feel, and protection provided by all waxes and paint sealants. The thick, frothy foam created by McKee's 37 Power Wash releases dirt and grime. The Gold Chenille Wash Mitt features hundreds of luxurious chenille fingers to make washing your vehicle safer than ever before. Each “finger” holds tons of soapy wash solution, providing ample lubrication as you swipe over the surface of your vehicle. Since the chenille strands are plenty long, they pull any dirt and grime away from paint, diminishing the risk of wash-induced swirl marks. 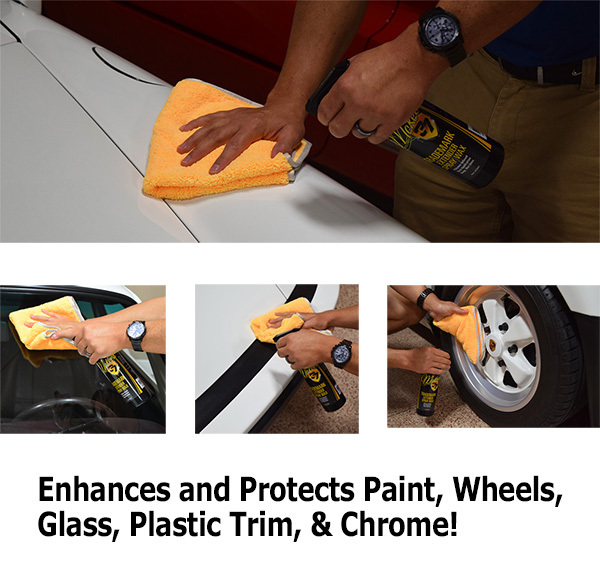 This highly versatile Microfiber Applicator is ideal for applying 10 Minute Paint Sealant. These luxurious applicators feature soft foam wrapped in low-nap 80% polyester, 20% polyamide microfiber making them ideal for use on delicate surfaces. Total retail value of $91.93. You save $31.94!